Come help Pack the Cruisers with food for Summer Lunch on Saturday, June 2, 10 am – 2 pm! All of the Hamilton County Kroger stores along with local law enforcement agencies are partnering with countywide Summer Lunch programs that will provide 75,000 meals to over 1400+ children for the ten weeks of summer vacation. When school is out some kids go hungry. Summer Lunch coordinators across Hamilton County will be providing food for children at a variety of programs that vary from hot served meals to healthy meal packs to extra food pantry privileges to packed lunches. These programs are designed to serve those children most in need throughout the county who would typically receive free or reduced lunches throughout the school year. Summer Lunch programs in Hamilton County are dependent on the local community for support as most of our communities do not meet federal or statewide Summer Lunch funding criteria. These primarily volunteer led lunch programs have stepped in to fill the need. The Pack the Cruiser Food Drive was piloted in 2017 in Fishers to help jump start food contributions. Last year Fishers filled eleven cruisers from three stores. 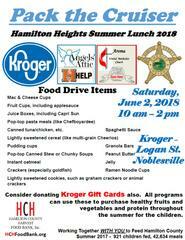 This year, nine Kroger stores will be matched with five Hamilton County city police departments and the Hamilton County Sheriff's Office to help the Summer Lunch programs in each of the six public school communities across the county. Police officers and sheriffs will be at the stores on June 2 with lists of the specific items that each of the programs need. Kroger Gift cards are very welcome also as this enables programs to purchase healthy fruits and vegetables and protein throughout the summer. Please help by donating the items from the list and Packing the Cruisers! Hamilton County Harvest Food Bank works closely with the Summer Lunch programs year round and is proud to be a partner of Pack the Cruiser 2018. This is our sixth year of monetary and food support for the Summer Lunch programs of Hamilton County. For more information; please see HCHFoodBank.org or contact Anita Hagen at hamiltoncountyharvest@gmail.com.